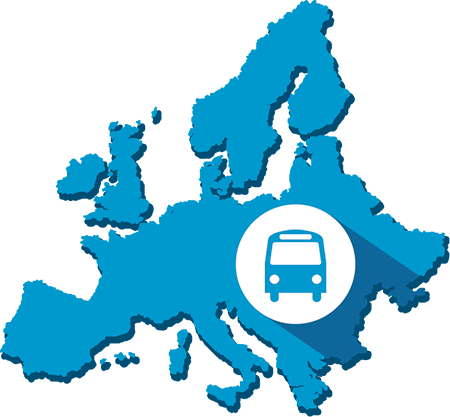 Use the intercity bus search engine on Android and iOS to compare all bus operators in Europe. Introducing our app for iOS. Introducing our app for Android. Just imagine, you are planning a trip by intercity bus from Berlin to Amsterdam. But how do you find the cheapest bus line for this connection and which is the best intercity bus in terms of service quality? Busradar.com is the leading website for comparing bus fares across Europe. In Europe, public transport carried out by private operators is extremely cost-efficient. According to the European Commission, regulated competition brings advantages to everybody. Travelling by long distance bus is not only a low priced alternative to car sharing or the Saver-fares of the Deutsche Bahn, it is additionally environment-friendly: measured in terms of passenger kilometers the intercity bus produces the lowest CO2-emissions compared to all other means of transportation. The intercity bus enables you to city-hop around Europe at a cheaper price. It is perfect for travelers who want to combine comfort, low carbon footprint, safety and reasonable budget all in one faraway trip. Already today there is a large number of long distance bus companies, who compete with their intercity bus travels for the favor of customers. This is why the long distance bus price comparison makes definitely sense in order to get the best ticket price. If you would like to book a long distance bus ticket, you do not only have the choice of several payment methods, but also a wide array of long distance bus providers. These include, among others, IDBus, terravision, megabus, and Eurolines. With their intercity bus connections, they offer regular bus trips with long distance buses all over Europe. The advantages of intercity buses are obvious: no other mode of transport lets you take in so many sights all over Europe and still have money left over for local cuisine and a few souvenirs! To benefit from these advantages, you are more than welcome to check out our long distance bus price comparison portal on busradar.com: you find all intercity buses, plus you are able to compare the intercity buses in terms of price and comfort and additionally benefit from numerous promotional fares, as for example the “Bahn Spezial” of the Deutsche Bahn. For this reason, busradar.com is your guidepost to the best bus trip and absolutely reasonable travelling all over Europe by long distance bus. True to our slogan: “all long distance buses at a glance” you find the long distance buses and their connections of Eurolines, megabus & Co clearly and transparently displayed on one single page: Just a few clicks away to your most suitable bus.